Vegan Cat Food - Can You Feed A Cat A Meat And Dairy Free Diet? You are here: Home / Food / Vegan Cat Food – Can You Feed A Cat A Meat And Dairy Free Diet? Vegan Cat Food – Can You Feed A Cat A Meat And Dairy Free Diet? Welcome to our complete guide about vegan cat food. Many of us are now choosing to reduce our consumption of animal products by either eating a vegetarian or vegan diet. But where does this leave our cats? Is it ok to feed them a meat-based diet while feeling uncomfortable about eating animal products ourselves? Or is it possible to feed cats a plant-based diet as well? In this article, we’ll take a look at the science behind vegan cat food. Is it a good choice for your feline friend? And if so, which should you choose, and how often should you feed it? We’ll answer those questions, and lots more. You may have heard others mention that fact that cats are obligate carnivores. If you’re not sure what this means exactly, or the implications for their diet, we’ll take a look at that too. First of all, let’s take a closer look at exactly what vegan cat food is. What Is Vegan Cat Food? Vegan cat food contains no animal products, or animal by-products. Vegan cat kibble will typically contain a mix of ingredients such as oatmeal, soy, dried peas, beet pulp, and yeast. Wet vegan cat food will usually contain a similar blend of vegetables such as carrots, potatoes, and peas. They may also include rice and oats. With either kibble or wet food, it’s important to ensure the level of protein within the food is high. It must also contain taurine, as well as a sufficient blend of the correct vitamins and minerals to meet your cat’s needs. You might also consider making a homemade vegan cat food. It can be difficult to ensure that homemade diet contains everything your cat needs though, so this isn’t an easy option. Is Vegan Cat Food Good For Cats? The answer to this isn’t clear cut, and certainly seems to divide opinion. There’s plenty of cat owners who feel that their cats thrive on a vegan diet. On the other side of the fence, some people feel it’s ethically wrong to deprive a cat of their natural diet. But rather than focus on anecdotal evidence, we’ll look at scientific evidence. Due to the lack of published studies, we also considered those which looked at vegetarian cat food. Let’s take a look at both sides of the argument now. One study in 2006 examined both the health of cats fed a vegetarian diet, versus those fed a conventional, meat-based diet. It was found that cats fed a vegetarian diet had normal levels of both taurine, and B12 (serum cobalamin). This study also examined the reasons behind cat owner’s choices to feed their cats a vegetarian diet. The reasons given were largely ethical, and that meat-based cat food products are potentially unwholesome. Many vegans are concerned about the quality and origin of meat-based cat food. Some diseases such as liver, kidney, and heart diseases have been documented in pets fed a meat-based diet. The website Vege Pets have summarised some of those findings. Bear in mind that due to the lack of studies on cats fed a plant-based diet, it’s impossible to know if there would be any difference if they were compared side by side. A study published in 2004 examined the nutritional content of two vegan cat foods. It found that they were both lacking in essential nutrients. This study did have its limitations, and the authors acknowledged that variations between batches, or the nutrient content of key ingredients means the results are not conclusive. Cailin Heinze, Assistant Professor of Nutrition at Tufts Cummings School of Veterinary Medicine, suggests that feeding cats a vegan diet is inappropriate for their physiology, and she doesn’t recommend it. One study examined what’s known as the ‘vegetarian dilemma’ when feeding our pets, although of course this can be extended to vegans. The study found that pet owners felt more guilt feeding their cats a vegetarian diet, when compared to dogs. 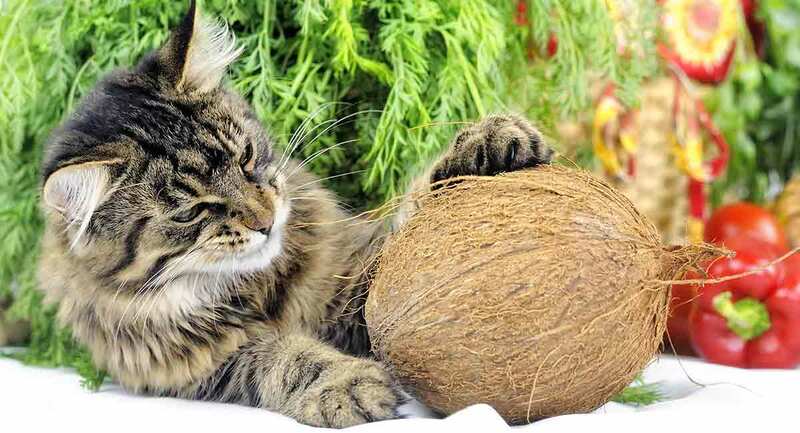 Participants mainly said that they felt vegetarian diets were inappropriate for cats, and that some felt guilty when imposing this choice upon their cats. In order to make an informed decision as to whether you would like to make the transition to using a vegan cat food, it’s important to understand which nutrients your cat needs. Cats need around 40% protein in their diet. This is usually in the form of meat. This protein contains taurine, an essential amino acid for cats. Unlike most mammals, cats can’t synthesise taurine from other amino acids. So they must obtain all taurine from their diet. Taurine is used by cats to ensure reproductive health, and for optimum functioning of their hearts, and eyes. Cats also need a range of vitamins in their diets. This includes Vitamin A, B1, and D3. The omega-6 fatty acid arachidonic acid is also an important nutrient, which cats cannot make themselves and must get in their diet. Whatever food you give your cat, whether it be meat-based or vegan, it’s important to ensure it contains suitable levels of these nutrients. If you do decide to feed your cat a plant-based diet, there are a few health implications to take into consideration. Many cat owners are aware that feeding their cat a vegan diet is possible, but that it can be problematic. Make sure that you speak to your veterinarian about these implications, and how to monitor your cat to minimise the chances of these problems developing. What Is An Obligate Carnivore? One of the main arguments against feeding your cat a vegan, plant-based diet is that cats are what is known as obligate carnivores. Obligate carnivores are also sometimes called true carnivores. Animals in this category are designed to eat a meat-based diet only. The nutrients that they get from this meat include the fatty acid arachidonic acid, as well as taurine, niacin, and the vitamins A, B1, and B12. Given that cats are designed to eat meat, it makes sense that they also require a high level of protein in their diets. If, after taking all the potential pros and cons of feeding your cat a vegan diet, you decide to go ahead, it’s best to select a ready-made product. This will ensure the correct levels of all essential nutrients should be met. Also, pet food brand Hill’s recommend selecting vegan cat foods which have passed clinical feeding trials, as these will be nutritionally balanced. Ami Cat Food is a trusted eco brand, and this formulation of vegan kibble is GMO free. It includes a balanced formula specifically for cats. Benevo Vegan Adult Cat Food contains 28% protein, spirulina, pre-biotics, and taurine. It’s also free of genetically modified ingredients, artificial flavors and colors. Wysong Vegan Feline/Canine Dry Food contains flaxseeds. It’s rich in vitamins, probiotics, and minerals. Evolution Cat Food provides 100% plant-based nutrition. It contains 30% protein, as well as using human grade ingredients. If you do decide to feed your cat a vegan cat food, it’s vital that you make the transition carefully, and with the support of your veterinarian. Veterinarian Andrew Knight recommends starting with a mix of 90% old food, and 10% new food. Gradually increase the amount of new food for a number of weeks. This will allow your cat’s digestive system time to adjust. It’s incredibly important that you monitor the acidity of your cat’s urine as you make the transition. Plant-based diets are higher in alkaline than a meat-based diet. An increase in urinary alkalinisation can result in the formation of urinary stones, which can block your cat’s urinary tract. The author of Obligate Carnivore, Jed Gillen, recommends establishing a baseline for your cat’s usual urinary pH before changing their diet. Monitoring should be carried out once a week while transitioning. After this, he recommends you monitor their urine once a month for the rest of their life. As with any other type of cat food, make sure you follow the guidelines for how much to feed your cat. Split their food into small portions spread throughout the day. And ensure that fresh water is always available. Is Vegan Cat Food The Right Choice For Your Cat? Only you can decide what the best choice for your cat is. If you do decide to transition your cat onto a vegan cat food, we strongly suggest you speak to your vet first. You may wish to keep a closer eye on your cat’s health as you make the switch. Some vegan cat foods are marketed as being suitable for both dogs and cats. While this might seem convenient, remember that dogs and cats have very different nutritional requirements. It’s always best to select a food which is designed specifically for felines. Of course, one option is to combine a vegan kibble with a high-quality meat-based wet food. Choosing to feed a plant-based diet to an animal that is ultimately designed to eat meat can be a difficult decision. Have you transitioned your cat onto a vegan diet? Or do you think cats should always be provided with access to meat? Gray et al. (2004). Nutritional adequacy of two vegan diets for cats. Journal of the American Veterinary Association. Wakefield, et al. (2006). Evaluation of cats fed vegetarian diets and attitudes of their caregivers. Journal of the American Veterinary Association. Rothgerber, H. (2015). Carnivorous cats, vegetarian dogs, and the resolution of the vegetarian’s dilemma. Anthrozoos. Coates. (2012). Can cats be vegetarians? PetMD. Gillen, J. (2003). Obligate carnivores: cats, dogs, and what it really means to be vegan. Steinhost Books. Hill’s. Vegan cat food for carnivorous felines? Should your pet go on a vegetarian diet? PetMD. What do cats eat? The Happy Cat Site. Urinary health of cats and effects of a vegan diet. VGRRR. Knight, A. (2008). Vegan pet food. Fishy business? Lifescape Animals. Your pet’s nutrition needs compared to yours. WebMD. Vegan animal diets: facts and myths. The Vegan Society. Becker. (2016). Got dogs and cats? Do this in a pinch, but don’t make a habit of it. Healthy Pets.